Syed Muhammad Azeem a.k.a. 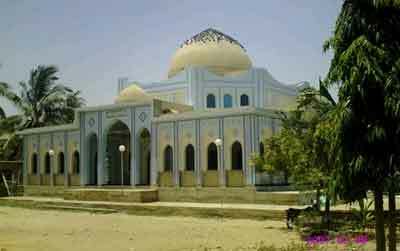 Qalandar Baba Awliya was born in 1898 in Khorja township of Buland Shehr,U.P., India. He was the direct descendent of Prophet Muhammad through Imam Hasan Askari, the eleventh. Qalandar Baba's maternal grandfather was a cousin of the great Indian Sufi Saint Baba Tajuddin of Nagpur. His mother was adopted by Baba Tajuddin and hence Qalandar Baba always referred him as his maternal grandfather. During his stay in Nagpur, his mother died, leaving four daughters and two sons. Qalandar Baba Auliya was the eldest son and most of his siblings were very young at the time. It was becoming difficult for him to serve as the surrogate parent for his siblings. Realizing that Baba Tajuddin arranged his marriage with one of his disciples' daughter in Delhi. Qalandar Baba moved his family to Delhi and worked there as a journalist until the partition of India in 1947. After the partition, he migrated to Pakistan along with his family, and stayed in Karachi's Lyari subdivision. At the time, Karachi was not a fully developed city and finding a job was hard. He believed in hard work and was not ashamed of odd jobs to support his family. Later on, he joined the local daily English newspaper Dawn and became its sub-editor. At 3 A.M sharp, Shaykh Abul-Fayz opened the door of his room and summoned him inside. Qalandar Baba Auliya sat before Hazrat Abul-Fayz, and Hazrat Abul-Fayz blew three times on the forehead of Qalandar Baba Auliya. On first blow, the Alam-e-Arwah (Cosmic World) was revealed to Qalandar Baba Auliya; on the second blow, the Alam-e-Malkut (Angelic realm); on the third one, the Arsh-e-Mu'alla (The Divine Throne). Once Khwaja Shamsuddin Azeemi was discussing with Qalandar Baba Auliya about the "Aura", he asked him if the Aura also could perform all the works that our material body performs. Qalandar Baba Auliya replied, "Yes, that's true" Khwaja Shamsuddin then asked, "Is it possible for someone to turn the electric swtich on or off by using his Aura?" Right when Khwaja Shamsuddin Azeemi finished his words, he heard the sound as some one pushed the switch button and the lights were turned off, then again, he heard the same sound and the lights were on. On one occasion, Qalandar Baba Auliya said, "Miracles are not that strange thing to be performed. When a person's conscious is subdued by his subconscious, he would do such things that are not considered normal. This could happen voluntarily or involuntarily. However, it has nothing to do with that person's spiritual knowledge or spirituality." One week before of his death, he told to his disciples and friends that, "I'm a guest here for a maximum of one week". He appointed Khwaja Shamsuddin Azeemi as the head of the Sufi Order of Azeemia. He made parda from the world on January 27, 1979. His tomb is in the Shadman Town subdivision of Karachi.